Moose has a home! - Rocky Mountain Great Dane Rescue, Inc.
Moose has a home with his new adoptive family in Overland Park, Kansas! 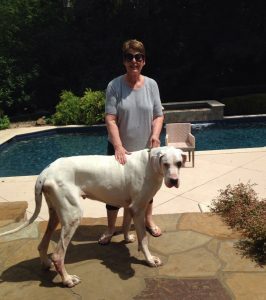 Janet and her husband have a love for giant breeds; they currently have 2 newfies and a cat. They’ve fostered a Dane in the past but have never been able to call one their own till now. Janet is a stay at home mom with her fur-babies….so all these big guys will get so much love and attention. They are also very familiar with his medical needs and are 100% on board to be there every step of the way to help him live a very comfortable life. Way to go Moose!!! !